Zombies usually don't take hikes at places like Sabino Canyon. If they are willing to try something new, however--say, hiking during the day, for enjoyment, rather than hiking around in the middle of the night, trying to scare little kids--then Sabino Canyon it is! 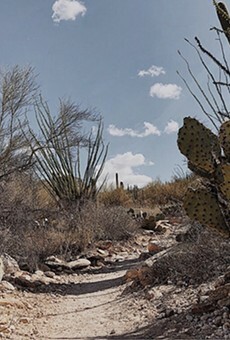 Nestled in the foothills of the Santa Catalinas, the canyon offers trails for hikers, bikers and anyone willing to get in touch with nature--zombies included. Don't fret if you are a novice hiker; the canyon's trails range in difficulty from easy to challenging, so beginner hikers can improve their skills with each new trail. Vote of note: "not telling"